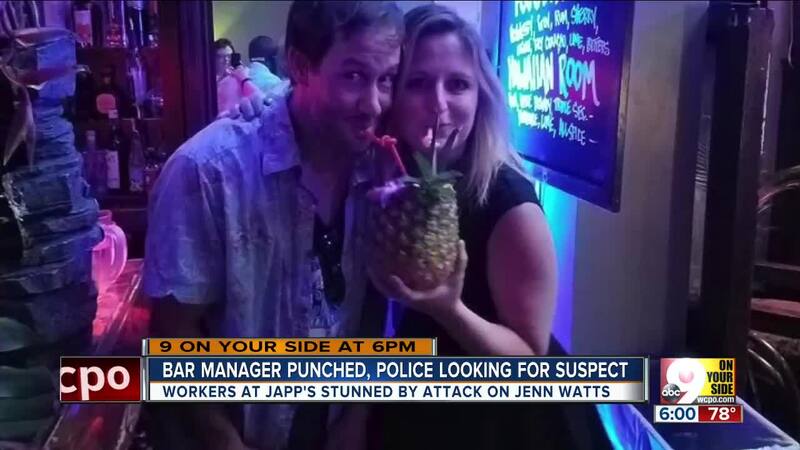 CINCINNATI -- Police have identified the man they say hit the manager of a popular Over-the-Rhine bar and injured her so seriously she needed brain surgery. Lucien Lanier, 33, is wanted on a charge of felonious assault. Japp's proprietor Molly Wellmann said bar manager Jen Watts was seriously injured in the attack by a stranger Saturday night. Wellmann said Watts was walking with a bartender when they noticed an upset man get into a car and ram another car, and the bartender pulled out his phone to record video. Police said officers responded at about 12:55 a.m. June 10. Lanier was driving a tan newer model four-door sedan and was involved in a minor crash in the parking lot at 1132 Sycamore Street. He got out of the car and hit the victim in her face, causing her to fall to the ground and hit her head. "She cracked her head," Wellmann said. "Then the guy knocked the phone out of (the bartender's) hand and drove off." The bartender tried to chase Lanier, then called 911. "If help hadn't gotten there when they did, she wouldn't have made it," Wellmann said. Police believe Lanier was "observed being very disorderly in front of Tree House Bar" just before the incident. "This guy was upset about something and took it out on an innocent -- doesn't hurt a fly -- person," Wellmann said. "She is one of the most hardworking people in Cincinnati and in this industry. She is incredible ... Luckily, she's healing." Police said Lanier has "a long history of felonious assaults, drug trafficking and domestic violence arrests. They asked anyone with information to call the District 1 Investigative Unit at 513-352-1271 or Crime Stoppers at 513-352-3040. "We have to catch this guy," Wellmann said. "We don't want him in our neighborhood. We don't want him to hurt anyone else."